I posted this fantabulous recipe a couple of years ago – but it is most deserving of a repeat performance! 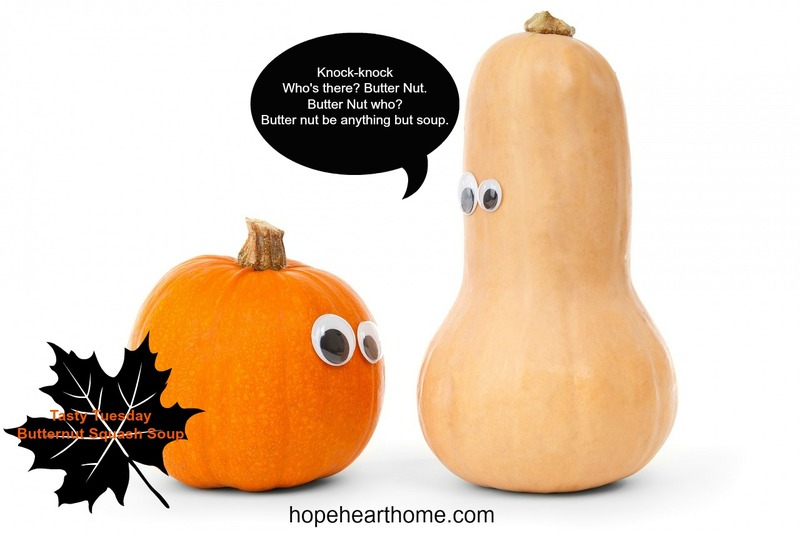 Last night on Facebook, Deidra Riggs, was looking for a butternut soup recipe and I sent her this one – she chose another to make, which suited her taste more. But, friends, this one is definitely NOT second best – it’s extremely good. And, doesn’t everyone enjoy Butternut Squash soup at least once in the Fall? Peel squash. Cut in half, scoop out seeds and cut in one inch cubes. Gently boil until soft. (You could also just cut the squash in half lengthwise, place flesh side down in a baking dish, with one inch of water and bake at 350 degrees for 40 minutes.) This morning I used the crockpot to do the cooking of the squash. Let the cooked squash cool down. In the meantime, sauté the onion and garlic in olive oil until tender. Now, place the cooked squash in a powerful blender or your food processor, with a little of the stock. Process until smooth and thick. Add mixture and broth to the onions and garlic. Season with salt, pepper and nutmeg. Heat to simmering. Serve piping hot. Delicious and extremely filling because of all the fiber! Serve in mugs or bowls. This creamy soup freezes very well. Ok – I would have never thought about this soup concept before. I’m not much of a squash person…but I’m thinking I might try this! Well! I have been missing out on some yumminess. I’ve never seen your tasty tuesday! (I’ve shared only one recipe on my blog … but have a couple of “legacy recipes” I’d like to share soon … so maybe … ) This looks wonderful! Need to put it on the rotation. Going to pin so I’ll have it later!! Yes, be sure to pin it, Dianne. Every Tuesday is Tasty at Hope Heart Home!!! Sounds delicious! We’re in a very hot spring here in Australia so will have to save this for when it gets cooler again. Yes, wait for cooler weather! I’ll have to try this one too! I love butter nut soup. Thanks for the reciepe. You are most welcome, new friend!